“Our model suggests SPX calls are more attractive than at any time over the past 20 years”. There must have been a mullets' breeding frenzy awhile back because it's hard to fathom how Goldman has any real customers left. Then again, its current preposterous call is just indicative of the horrible threat heading menacingly toward what remains of main street's 401k investments. To wit, the Fed and other central banks have thoroughly falsified financial market prices and destroyed all of the ordinary mechanisms of financial discipline. Foremost among these are short sellers and a meaningfully positive cost of carry trades. Markets are therefore unhinged from any connection to fundamental economic and financial reality, meaning that they are capable of an extended period of spasmodic deadcat bounces that will have only one end result. Namely, the naïve and desperate among main street investors who still, unaccountably, frequent the casino will presently be taken out back and shot yet another time. The market technicians are pleased to call this "distribution". Would that someone on Wall Street man-up and amend the phrase to read " distribution.......of losses to the mullets" and be done with the charade. The S&P 500 is heading through 1300 from above long before it ever again penetrates from below its old May 2015 high of 2130. And now that 97% of Q4 results are in, there is a single number that proves the case. Reported LTM profits as of year-end 2015 stood at just $86.46 per S&P 500 share. That particular number is a flat-out bull killer. At a plausible PE multiple of 15X, it does indeed imply 1300 on the S&P 500 index. It also represents an 18% decline from peak S&P 500 reported earnings of $106 per share back in September 2014. And more importantly, it means that the robo-machines and hedge fund gamblers have traded the market back up to 23.1X earnings. That's off the charts.......except for when recession has already arrived unannounced by the hockey stick factories of Wall Street. But here's the thing with respect to the scarlet 23.1X numerals now painted on the casino's front entrance. It comes at a time when the so-called historical average PE ratios are way too high for present realities. That is, in a world sliding into a prolonged deflationary decline, capitalization rates should be falling into the sub-basement of history. Why? Because current earnings are worth far less than normal owing to the prospect that renewed earnings growth anytime soon is lodged somewhere between zero and none. So when capitalization rates should be plunging the casino has them soaring, while pretending its all awesome on the earnings front. In a nearby post, Lance Roberts puts the story in devastating historical context. For the third time this century, corporate earnings are already in free fall, yet the Wall Street hockey sticks are still pointing archly to the upper right of the chart. Yet this time the backstory is even sketchier. When reported S&P 500 earnings peaked at $84.92 per share in June 2007 (LTM basis), they had grown at a 6.8% annualized rate since the prior peak of about $54/share in Q3 2000. By contrast, at the reported $86.46 level for the LTM period ending in Q4 2015, the implied 8-year growth rate is.......well, nothing at all unless you prefer two digit precision. In that case, the CAGR is 0.22%. That's right. Based on the kind of real corporate earnings that CEOs and CFOs must certify on penalty of jail time, profits are now barely above the June 2007 level, and are once again heading down the slippery slope traced twice already during this era of central bank bubble finance. 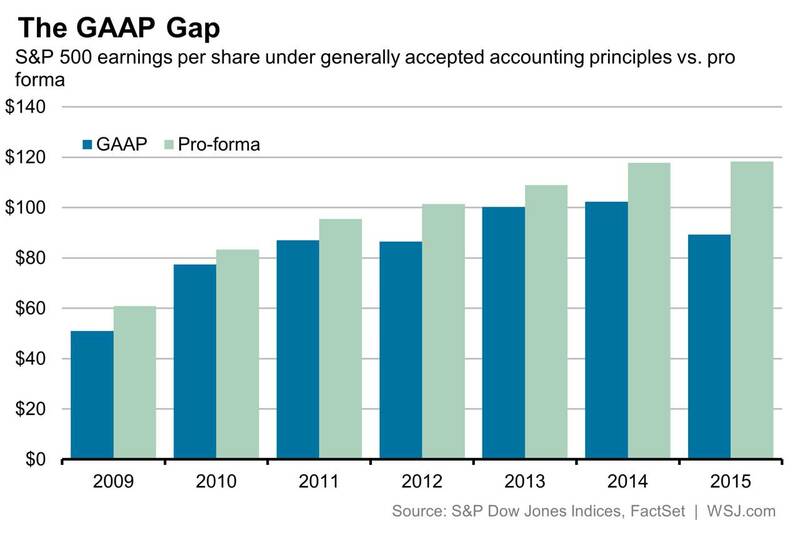 Yes, the sell side stock peddlers will tell you that notwithstanding the fact that Uncle Sam spends upwards of $1 billion per year pursuing accounting malefactors, these GAAP profits are to be ignored because they are chock-a-block with non-recurring items. Well, yes they are. As an excellent recent Wall Street Journal investigation showed, the Wall Street version of ex-items earnings came in for 2015 at $1.040 trillion for the S&P 500. But that was 32% higher than actual GAAP earnings of $787 billion! Supposedly, the $253 billion difference indicated for 2015 in the chart above dudn't amount to nothin' when it comes to valuing stocks. After all, what do the principal non-recurring items------asset write-offs, plant shutdowns, store closing costs, goodwill reductions, restructuring charges and stock options costs------have to do with Wall Street's authoritative EPS hockey sticks? The latter always and everywhere trend from the lower left to the upper right of the charts. And that's because, apparently, by the lights of Wall Street central banks always have your back..
Not exactly. The above chart has been generated over and over and has been spectacularly wrong nearly as often, and most especially at turning points in the business cycle. Indeed, the yawning $253 billion gap between reported earnings and the Wall Street ex-items concoction for 2015 is nearly the same magnitude as the disconnect in the Great Recession cycle. Thus, S&P 500 aggregate net income on an ex-items basis for 2007 was $730 billion---so the sell side pitchmen had no problem insisting that the stock market was "reasonably" priced. During 2007 the S&P's average capitalization was about $13 trillion, implying an 18X PE multiple. In fact, however, actual GAAP earnings that year were only $587 billion, meaning that the Wall Street ex-items number was 24% higher than the level of profits filed with the SEC. Like now, the pitchmen said ignore the $144 billion of charges and expenses that were deemed to be non-recurring; nor did they even remotely recognize the real market multiple on a GAAP basis was 22X and that this was extremely expensive by any historic standard---especially at the top of the business cycle. Needless to say, Wall Street was shocked-----just shocked----to find out the truth about it hockey sticks the next year. During the spring of 2007 it had happily predicted the usual-----that is, that ex-items earnings would rise by the usual 12-15% to about $120 per share in 2008. They actually came in, however, at $50 per share on an ex-items basis, but only $15/share on an honest GAAP basis. Expressed in aggregate terms, the latter means that S&P profits plunged to $132 billion during 2008 after companies took a staggering $304 billion in write-downs for assets which were dramatically overvalued and business operations which had become hopelessly unprofitable. In short, during those two years alone---when the business and financial cycle was heading sharply southward-----the S&P 500 companies took nearly $450 billion in charges and losses that the Wall Street stock peddlers said to ignore. That amounted to full 37% of purported ex-items earnings for 2007-2008 combined. Stated differently, the market is supposed to be a forward discounting agency. Yet at the peak in October 2007 at a time when the subprime and credit markets were visibly fracturing------the Bear Stearns mortgage funds and Countrywide Financial had already blown up and Merrill Lynch and AIG were in evident distress-----the index was being valued at $13 trillion based on the goldilocks theory then prevalent on Wall Street. That's right. The stock market was trading at 100X the earnings that actually materialized the next year, not at 13X the forward hockey stick which the talking heads peddled on bubblevision day after day. So here we are again at the inflection point of an even more egregious central bank fostered financial bubble. Like back then, the massive one-timers recorded during 2015 consisted of real corporate cash and capital that was destroyed------more often than not owing to bad business decisions that had earlier resulted from central bank falsification of interest rates and the price of debt and equity securities. For instance, during 2015 one part of the gap was accounted for by the fact that the energy sector of the S&P 500 reported actual losses of $45 billion collectively but on an ex-items basis claimed profits of $48 billion. Did that $93 billion difference amount to a financial nothing? No it didn't. Instead, it was comprised primarily of massive write-downs of the carrying value of oil and gas reserves. Yet it was the global credit boom enabled by central banks which first drove the price of oil above $100 per barrel and encouraged massive malinvestment in high cost and excessive reserves. And then, to add insult to injury, it was the drastic post-crisis repression of interest rates under the ZIRP and NIRP regimes which ignited a massive scramble for yield among money managers and homegamers alike. This central bank caused deformation, in turn, encouraged E&P companies to borrow upwards of $400 billion on the junk bond and junk loan market to fund investments in shale and elsewhere which were never remotely economic. Those giant write-downs may be construed by Wall Street as non-recurring irrelevances, but in fact they amount to dead weight losses of real capital. The same is true with the other sectors analyzed by the WSJ investigation. Materials companies reported $13 billion in GAAP earnings compared with $30 billion in ex-items profits. And health-care companies earned $104 billion under GAAP versus $157 billion as imagined by Wall Street analysts. Yet once gain, the $70 billion difference in these two sectors wasn't chump change, nor was it invisible fairy dust. For the most part it represented asset write-offs and restructuring charges from uneconomic investments and failed M&A deals. That is, the very thing which central bank falsification of financial prices inevitably fosters. Even in tech, the degree of earnings fudging by Wall Street last year was egregious. While the hockey stick brigade dutifully reported $218 billion of aggregate profits for the tech sector, the reports sent to the SEC showed only $176 billion. Among that $42 billion of invisible red ink was a lot of busted M&A deal write-offs and stock options costs that do absolutely dilute shareholder earnings. In a recent BloombergView post on the folly of negative interest rates Michael Schuman got it spot on. While he was focusing on the absurdity of the fact that investors are now paying cash to the government of Japan when it borrows ten year money, the general principle is universal. Indeed, what party other than the BOJ could be buying negative coupon debt? The answer is exactly why the coming financial crash will be so severe and long-lasting. To wit, it is front-runners expecting to cop a capital gain, and then get out before the house of cards collapses. The culprit is the Bank of Japan. The entire purpose of its unorthodox stimulus programs — quantitative easing, negative interest rates — is, in effect, to get prices wrong: to press down interest rates below where they would normally go and force banks to lend money in ways they normally wouldn’t. The BOJ, in other words, is trying to alter prices to change the incentive structure in the economy in order to engineer certain results — to increase inflation, encourage investment and spark growth.The problem is that the BOJ hasn’t achieved any of those objectives. Inflation in January, by one commonly used measure, was a pathetic zero. Gross domestic product has contracted in two of the past three quarters. Instead, the BOJ is creating new problems by undermining the price mechanism. The central bank is buying up so many government bonds that it has effectively stripped them of risk to the investor and cost to the borrower. Investors probably bought up the bonds with negative yields speculating that they could flip them to the BOJ. That's what might otherwise be called an ambush. The trillions of speculator dollars crowded into trades of this type throughout the global financial markets will never get through the narrow door of liquidity that remains in the casinos. The dotcom and the post-Lehman meltdowns were only the rehearsal.